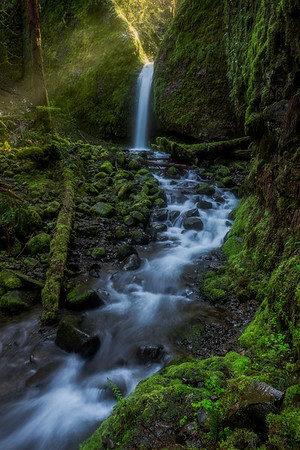 Having never been to the waterfalls of the Columbia River Gorge, I really didn't know what would be involved in getting to the Mossy Grotto. I had only seen photos from friends online and thought "wow, that looks amazingly beautiful". The directions friends gave where something along the lines of hike this trail, there will be about 437 switchbacks, when you get to the downhill section "don't die" and if you find the river you are pretty much there. Other than a couple of bruises from some slipping on some rocks, dirty pants and soaked hiking boots that took 3 days to dry out... I safely made it to this point and I can honestly say it was one of the most beautiful waterfalls I saw that weekend and I'd gladly do it all again.